This next seller submission is from Tim C.who writes: I've decided to sell the beast. 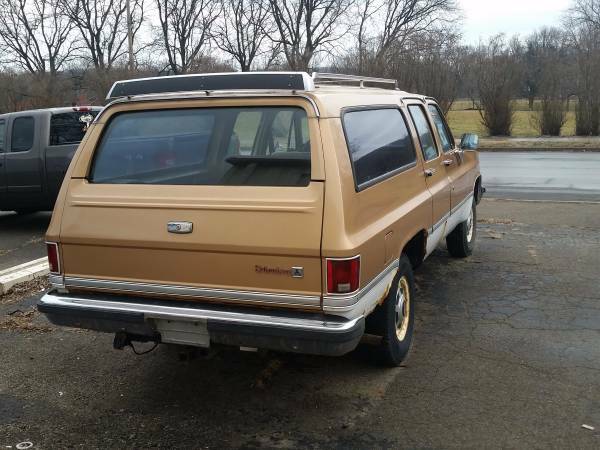 Its just a rusty but trusty old suburban and it'll probably go to some yokel for $1000 but I'd love to see it go to a good home. We only had it for a few years but it was the car I hauled my newborn triplets around in so it has some serious sentimental value. I'd love to fix it back up but I've go no time or money so I thought I'd see if any one here might like it. Would be a great race car hauler, as long as gas stays cheap, it pulled a drag car before I bought it. 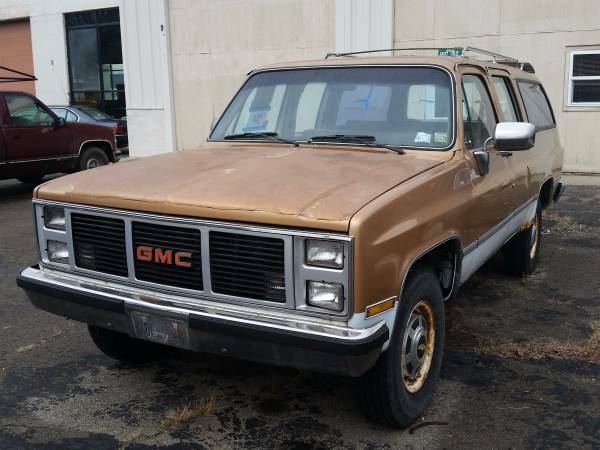 Find the beast, a 1986 GMC 2500 Suburban offered for $1400 in Corning, NY via craigslist. Tim continues: Oh and the Odo says 35k, but I have no idea how many times its rolled over. 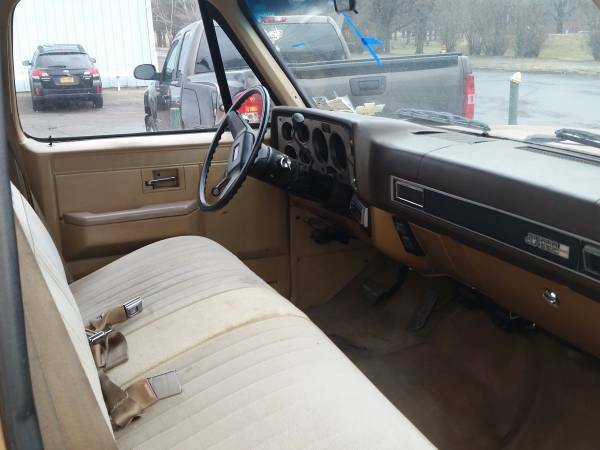 maybe it really is 35, but its a low compression big block with a th400 and a full 14bolt, it could have 435k and it wouldn't change my opinion of the truck. And the underside isn't nearly as bad as you might expect, it was in PA until I bought it and they sand the roads instead of salt. I have some pics from when we first got it and it looked pretty good other than the peeling paint on the hood from a crappy respray. The seventh generation GMC/Chevrolet Suburban was a four door monster built on a chassis shared with the third generation of GM's C/R & K/V trucks. These are serious machines and the beast looks like a good running (but ugly) example offered for a fair price. I had one of those, a '91 2WD. '91 got you the four-speed transmission. Strong like bull. Mine had the split seats and console, curiously the recliner mechanism on the seats in those things was a Recaro vernier knob. The TBI-injected peanut-port L19 454 makes decent torque but is pretty much useless by 3500-4000RPM. The intake ports are tiny, about the size of the worst 302 Ford head. Send the steering box to Lee Mfg. and have them put in a stiffer valve (31oz/in? 33oz/in? Can't recall...) it makes all the difference in the world. Currently have an '03 2500 4x4, with the 6-liter LQ4. Engines are entirely opposite one another. The LQ4 hasn't got a ton of torque (for a 7000lb truck anyway) but it also doesn't seem to mind spinning 4000RPM+ indefinitely climbing hills in second. Hey, my truck! The steering was always pretty good, 2wd chevy trucks are ok, many of the 4wd seem to have no feedback whatsoever. Like I said, I realize this isn't exact an exciting DT ride but it does have a certain presence going down the road. While its as far from my 75 mini as possible in terms of driving experience, it does have a little bit of that inexplicable smile factor when going down the road. Plus I once had my wife, my cousin in law and 4 infants, while I was alone in the 3rd row. I'd post a pic but I'm not entirely sure how. Its not worth creating an account on some hosting site for. Believe me, the steering gets MUCH better with a stiffer spool valve. Like the difference between a '73 Electra and a '79 Trans Am WS6, because that's basically the parts involved. If I had more room I'd have kept mine, but was out of space then and it's even worse now. Yours definitely looks to be worth what you're asking. Oh and this isn't TBI, its Quadrajet, last year of 'em. And again sorry for using 2 names, I made this one long ago and for some reason it pops up on my PC but my phone uses my real name. Oh, and I also swapped in a steering wheel off a Buick Skylark T-Type, pretty much any pre-airbag GM wheel will fit if you want something smaller than stock but the Camaro, etc. wheels were TOO small, the Buick wheel was a bit over 15in, $10 or so, and worked nicely. I think I still have a set of Porterfield R-4S brake pads I ordered to fit it. Free to whoever buys yours if I can find them. Unfortunately Tommy Lee retired and closed up shop last year.